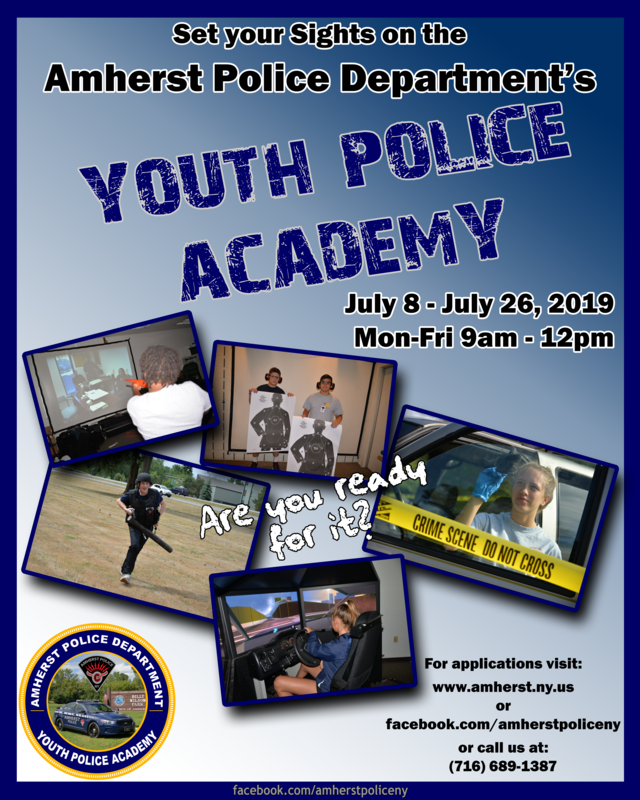 The Town of Amherst Police Department’s Youth Police Academy is an internship program for high school students considering a law enforcement career at the local, county, state or federal level. In addition, this program meets the minimum requirements of the NYS Education Department’s Career Exploration Internship Program (CEIP), allowing participating students to receive high school credit toward graduation upon successfully completing the academy. To receive credit, the student must also apply for the internship through their school Internship Coordinator prior to entering the academy. Although the primary purpose of the academy is to acquaint the students with the various functions of the Town of Amherst Police Department, the students will also discover the minimum qualifications, training requirements and daily responsibilities of other county, state, and federal law enforcement agencies through guest speakers and tours of their facilities. Students will view actual pictures and video of crime and accident scenes, have the opportunity to take the actual physical fitness test required for police officers, can be exposed to O.C. (pepper) spray, and will take part in the Firearms Training Simulator and shoot the Amherst Police standard issued handgun. In addition to the regularly scheduled sessions, students will ride with an officer for an 8-hour tour of duty and participate in a courtroom observation. The 3-week academy is held from July 8th, 2019 through July 26th, 2019, Monday through Friday, from 9:00 AM– 12:00 PM at the Town of Amherst Police Headquarters, 500 John James Audubon Parkway, Amherst, N.Y. A graduation ceremony will be held on Monday July 29th, 2018 at 7:00 PM following the completion of the academy. Family and friends are welcome to attend. Parental consent is required for students to participate in the academy. All applicants must successfully complete a background investigation and interview. Applications may be found below. Completed applications must be submitted to the Amherst Police Department by May 1, 2018. Any questions, please contact Officer John McGarvey at (716) 689-1387. Students, whether attending the academy or during off-training times, will not engage in conduct unbecoming a member of the academy. Professional demeanor will be maintained at all times. Students are expected to attend all classes. Only an absence for a legal excuse will be permitted. Unauthorized absences or legal absences exceeding 2 days will result in dismissal from the academy. In the event of a legal absence, the police department Internship Coordinator must be notified of the absence by 9:00 AM of that day. Tardiness will not be tolerated. A student who is more than 15 minutes late will be considered absent. A student who is less than 15 minutes late on 3 occasions will be dismissed from the program. Clothing: Wear comfortable, casual attire however, jeans and shorts are not permitted. Grooming Standards: Participants will be clean-shaven at all times. Males - Hair shall be neat, clean, trimmed and present a groomed appearance. Students will come to class prepared for scheduled lessons and will bring with them all necessary materials. Expect to participate. Each student should be able to contribute something to our discussions and should do so regularly. Students must maintain a 3-ring binder (1/2 inch, black) to save handouts and record notes from the class lectures. Failure to comply with any of these regulations may result in dismissal from the academy. An 8.25 hour ride-along will be scheduled in addition to the classroom / court sessions.